Husband had just a few Christmas decor requests: twinkle lights (done) and a nutcracker. Request number two was so difficult! 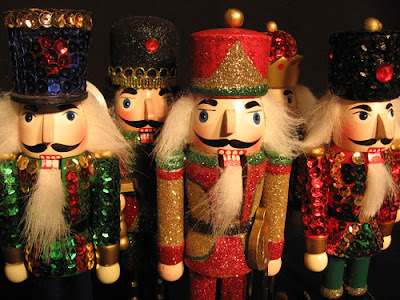 I found a ton of nutcrackers all over - Joann's, Target, TaiPan, TJMaxx, Ross, Hobby Lobby, Kohls and so on. One problem - I wanted a 'normal' nutcracker...picky me! The nutcracker from the story/play is a hero - brave defender of little ladies against huge mice (terrifying! )...so why were all the ones I could find of him pink...and glittery? (yes, my abilities to manipulate photos are remarkable...no, I don't work for hire). Then I found a ton of non-nutcracker nutcrackers. Chef, fisherman, 49ers player (this one almost made the cut for Husband), a punk rocker girl? Oh - and they were all made super cheaply, but were rather pricey! Their little faux fut beards were glued on sideways and their rosy cheeks made them look like little men of the night. Where were the normal ones?!?! He's perfect! Well, almost, his cracker was a little broken, so I glued it in place, so he can't crack any nuts (who uses it for that anyway?). But, shoot, for $3.99 and looking normal - I'll take it! 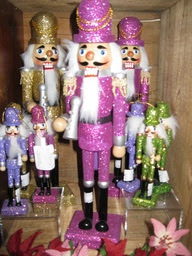 Maybe the real issue was that I grew up with nutcrackers that looked like this little guy - looking like a protector, not embellishments, just paint and some fake fur. He watches over our living room in case any large mice try to attack. I had to tell him that Stella is a dog and belongs and to not confuse her as a large mouse...he needs reminding when she's all wet after a bath. Haha - absolutely not! Some of them are really cool looking. I guess I've just become a picky consumer where I want exactly what I want all the time - so they should just make 250 styles to appease everyone :).